The issue starts off with Yoda explaining how the mountain is alive, but just barely. Somehow he and Garro meditate and bring it back to life. They then leave the mountain, but Garro quickly turns on Yoda in order to rejoin the Rockhawkers. They warp the mountain with the dark side and urge it to commit revenge on their enemies. Meanwhile, Yoda touches base with the other group of survivors, then goes back to stop the mountain. However, before we can see the end of the story, Luke interrupts and decides to visit the planet. As a poster boy for impatience and stupidity, Luke finds himself in trouble as he find the corpse of the mountain and an older Garro who has been waiting for the Jedi’s return. One one hand, this story really does have a fable/fairy tale vibe too it. Part of it is the fantastical outlandishness of a living mountain being brought back to life and then Yoda having to face off against it. The other part of it is how things aren’t really explained. There’s a lot of hand waving. We don’t know how Yoda brought the mountain back to life, why it was dying, what the mountain wants, and even the reason why Yoda wanted to keep the Rockhawkers from knowing the mountain was alive was kept a secret. We can infer it was because he thought they would misuse it, but the story keeps the reader in the dark throughout the entire issue on many of the questions it raised. 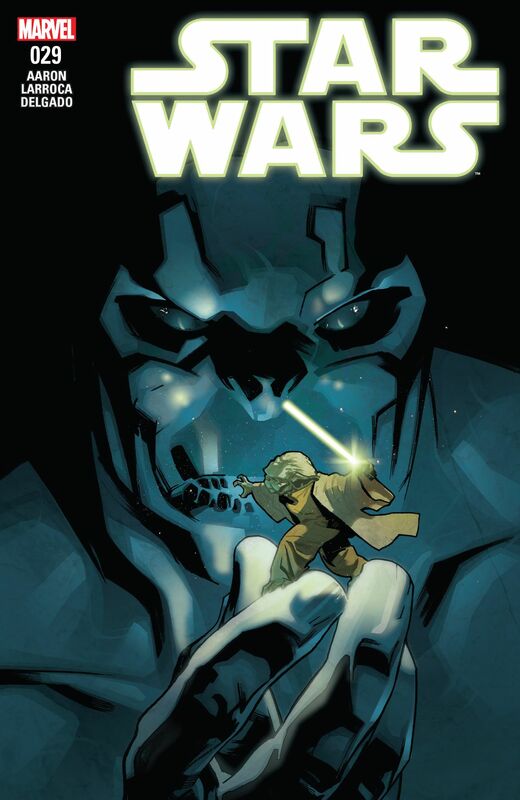 Going the fairy tale route with Star Wars is one thing, but Jason Aaron pulled on other storytelling trick that may or may not set well with readers. Rather than finishing the story off, it’s interrupted because Luke wants to go see the mountain for himself. Now this does create suspense. How does the story with Yoda end? However, it also makes Luke look really bad. It makes emphasizes his impatience as well as his stupidity. Wisdom would be finishing the story before leaping off to visit the location. By having Luke jump the gun, it shows his lack of wisdom. I guess it’s fitting with his character in this time period, but it doesn’t necessarily make for the best story. It’s a smart way to integrate Luke into the story, and to bring it back to the current narrative, but it also puts Luke in a negative light, which jeopardizes the main character. I’m not sure it was the right move. With Yoda communing with mountains enraged by the dark side and Luke having to fight a person with a floating knife shield, you’d think this issue would be more fun. Alas, it misses the mark in a few areas and holds back where it needs to leap forward. While this issue may be a good setup for the next one, it doesn’t hold up so well by itself. I give it a three and a half out of five metal bikinis. It’s interesting, but it leaves you wanting.